BBQ enthusiasts know low and slow leads to the tenderest meat. 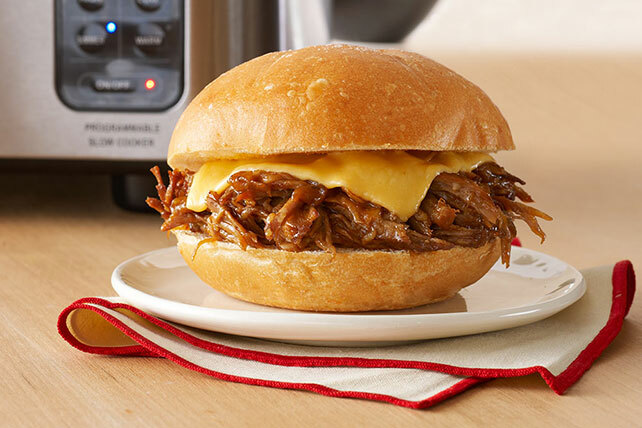 Use your slow cooker to get the same results for these pork sandwiches. Place meat in slow cooker; top with onions and barbecue sauce. Cover with lid. Cook on LOW 8 to 10 hours (or on HIGH 4 to 5 hours). Remove meat from slow cooker; cut off and discard excess fat. Chop meat into small pieces or shred with fork. Return to slow cooker; stir to coat with sauce. Fill rolls with meat mixture and Singles just before serving. For added color and texture, serve with a mixed green salad tossed with your favorite KRAFT Lite Dressing. Serving a crowd? Prepare as directed, doubling all ingredients. Makes 16 servings.